Real time supervision with the impressive latest technology Across® SCADA solution. All operational values are stored and displayed in real time across any geographical location. Mechanical, electrical, climate, and any other information generated by the part is stored and made available. Total operational Control. 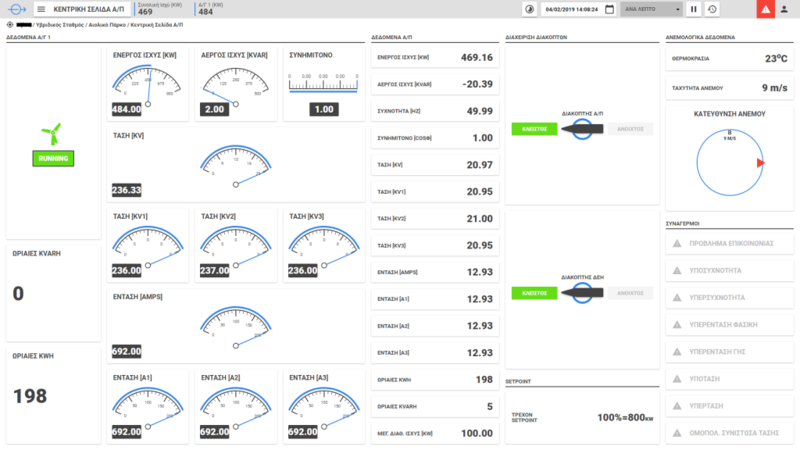 Local HMI or remote location, Across® Wind offers the user total control over the output of each wind turbine, the electrical beakers and substations as well as the energy metering device. GIS providing correct Geographical allocation of all parks monitored under a single system and its detailed electrical infrastructure. Forecasting capabilities helping at projecting usage, planning minor technical interventions and earnings estimation. Sophisticated reporting & dashboard interfaces help high level digest of info. Especially designed Web & smart phone environments allow immediate notifications as well as the ability to perform all supervisory & control tasks from anywhere. Across® Wind is extremely versatile and can be installed in many different forms to accommodate all customer needs. It can be a completely on-premises system resulting on a robust private network of servers offering total control and unparalleled big data management. It can be installed as a centralized system only where data generated is transferred live to a centrally managed system. Lastly it can be also obtained as a simple Cloud based service. Every topology has its techno-economical benefits. Finally, Across® Wind is designed and developed to be compatible with all type and wind turbine manufacturers. Its interface allows non-technical people to easily add equipment and modify all needed parameters in a graphical UI. In the event that a more technical intervention is needed, the MAS development team can always provide remote assistance for more complex tasks.